One of the best wordpress themes ever, the Climatic wordpress theme is unique and one of its kind as compared to the other wordpress themes. This is a dual skin wordpress theme. Dual skin implies, that the theme has a button on the sidebar that will enable the user to change the skin of the theme from summer into a winter skin. This feature, makes the theme very unique and also at the same time extremely alluring for the visitors. 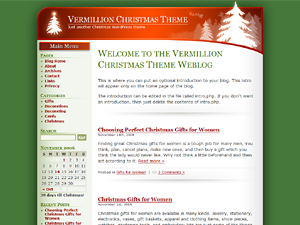 This theme was designed by web2feel.com. Both the seasonal skins, cleanly express the seasons and their own beauty. The summer skin in the theme is largely green in color that actually displays the green nature around. The theme has a beautiful green pattern as the background with a huge and distinct header comprising of a beautiful blue sky and a huge plantation. The header also comprises of a distinct and traditional navigational bar that allows the user to easily access the various categories of the blog. It is two columned fixed width theme. The sidebar of the theme is distinct with soft edges and the content area is simple with a white base which contrasts to the background. 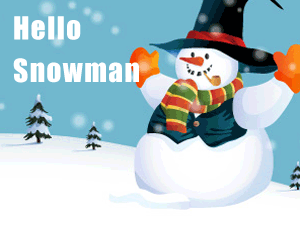 The winter skin in the theme is mostly same except the color that changes to icy blue. 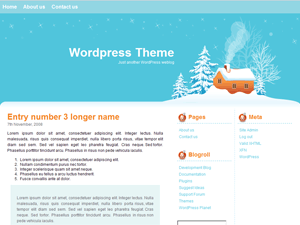 The header of the theme also changes into the beautiful ice covered fields, pines and houses while the background pattern and the sidebar design remains the same.